Grenache is one of the world’s most planted grapes. Most of these vines are in France and Spain. In 1982, Rhône Valley enthusiast Randall Grahm at Bonny Doon Vineyards in California made his first Grenache wines. The term Rhone Rangers was coined to describe producers with a penchant for Rhône grapes. Grenache was on its way to stardom in California. It doesn’t stop raining in Bordeaux. As spring progresses, wine producers face problems. It is difficult to drive the tractor and to walk in a wet and muddy vineyard. This is inconvenient for those growers who mechanically remove the weeds. Maintenance in the vineyard, such as replacing the poles that hold up the wires, is delayed. They will probably have problems early in the season with mildiou, a fungal disease. Since November Bordeaux has had about 500 mm of rainfall (the region usually has between 600 and 800 mm per year). Rain is a good thing, but now they want it to dry up a bit so that they can start working in the vineyard. Read more here vitisphere.com. Weather will for sure improve so there are good reasons to come on a wine tour to Bordeaux this spring with BKWine. Or alternatively a wine tour to Bordeaux in the fall. Comité Champagne has published their sales figures for 2017. Champagne made a record turnover of 4.9 billion euros in 2017. 307 million bottles were sold, a slight increase compared with 2016. The sales record counted in volume from 2007 is still valid. 338 million bottles of champagne were sold that year. Tasting champagne in Champagne is a fantastic experience, especially on a wine tour to Champagne with BKWine. Book now! France has 806,000 hectares planted with vines. This area includes about 70,000 hectares used for Cognac. Three grape varieties take up one third of this area: Merlot (112,000 hectares), Ugni Blanc (82,000 hectares, which is used mainly for Cognac) and Grenache (81,000 hectares). After the top three follow Syrah (64,000), Chardonnay (51,000), Cabernet Sauvignon (48,000), Cabernet Franc (33,000), Carignan (33,000), Pinot Noir (32,000) and Sauvignon Blanc (30,000). 70% of the total French vineyards are planted with these top ten grape varieties. Source: oiv.org. Flavescence dorée is a dreaded bacterial disease that spreads through a grasshopper. It was discovered for the first time in 1949. In France it is especially difficult in parts of the southern Rhône Valley and Provence. Here we can even see a decrease in the number of organic producers because it is mandatory in some areas to spray against the grasshopper. 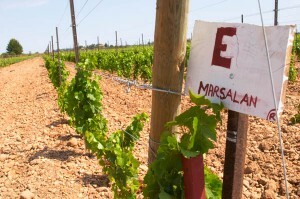 Nine new grape varieties have been approved to be planted in the French vineyards. Five of them are old, almost extinct and forgotten grape varieties from the Southwest, from Gaillac, Fronton and other southwestern appellations: Bouysselet Blanc, Tardif, Verdanel Blanc, Gibert and Noual. The other four are so-called resistant grape varieties. These are new crosses between European grapes and various American grape varieties. These hybrids (=a crossing between vitis vinifera and another vitis variety) have good resistance to fungal diseases such as mildiou and oidium and sometimes also other diseases. The grapes are Vidoc, Artaban, Floréal and Voltis. The first two have as parents Rotundifolia, an American grape, and Regent, which in fact is a cross between a European grape and a hybrid. The idea is, of course, to reduce the need for spraying with pesticides. It will be interesting to see how these grapes are received by the wine producers. And by the wine consumers. Read more mon-viti.com. During our visit to South Africa at the beginning of March, the harvest was in full swing. The very difficult, and prolonged, drought in the wine regions of the Western Cape affects the grapes of course. But most of the producers we met told us that although the volume in most places will be small this year, the quality is good, sometimes even very good. Peter-Allan Finlayson at Gabrielskloof (where he is the wine maker and where he also makes his own wines under the Crystallum brand), says that 2018 will be a small harvest but of good quality. “We harvest early this year to maintain freshness,” he says. At Springfontein in Stanford, wine maker Tariro Masayiti agrees. He is very pleased with the quality and maturity of the grapes. And at the biodynamic vineyard Reyneke in Stellenbosch, Johan Reyneke says that he will even have a good volume this year, perhaps thanks to the soil (granite and sandstone), perhaps thanks to the way they work in the vineyard (e g biodynamics). We tasted the vintage 2018 during our tour, both as unfermented juice and after just finished fermentation. We all agreed it was of excellent quality! South Africa is a treasure trove of excellent wines, many little known outside the country. Join us on BKWine’s discovery wine tour to South Africa in November. And then there will be one more wine tour to South Africa in March. Italy shot to the top position in 2012, as the country selling most volume of wine into Sweden, and is still there. Not threatened by anyone at the moment. In 2017, 56.8 million litres of Italian wine were sold at Systembolaget, the Swedish retail monopoly. France, in second place, sold a meagre 26.5 million. The Italian dominance is absolutely incredible. Spain is number three with 21.7 million litres and South Africa number four with 20.3 million, after previously having been in the lead until Italy won that position. Looking at the statistics for red wines, we have Italy in the top slot, Spain in second place and France in third place. For white wines South Africa leads before France and Italy. France’s 26.5 million litres are divided between approximately one third red, one-third white and one-third Champagne. Quite incredible, the popularity of Champagne in Sweden. One should keep in mind when reading the numbers that a few best-selling “box wines”, bag-in-box, can have a big effect. (More than 50% of all wine sold in Sweden is in BiB.) The biggest selling wine alone accounted for 3 million litres! At 159 kr (~16 euro) for three litres (=4 bottles). It is Spanish and represents well over 10% of Spanish wine sales in Sweden. Statistics from systembolaget.se. Is the consultant oenologist the most important person in the Bordeaux wine cellars? Maybe, maybe not, but few Bordeaux chateaux nowadays make their wines without one. One of these consultants is Stéphane Courrèges whom we met recently when he was in Paris for the day. Sometimes they are simply called “wine consultants” or even “flying winemakers”. Why do the chateaux need a consultant oenologist? There are several reasons, one obviously being the added knowledge an oenologist bring to the wine making process. Read more in Britt’s article on BKWine Magazine, originally published on Forbes: The real job of a wine consultant in Bordeaux, with Stéphane Courrèges | Britt on Forbes. Wine consultants, wine makers, and plenty of good wines, there are good reasons to come on a wine tour to Bordeaux this spring with BKWine. Or alternatively a wine tour to Bordeaux in the fall. Chile and Argentina in January 20 – February 4, 2019, the two leading South American wine countries. South Africa, February 2019. The world’s biggest chenin blanc country, with world-class whites and reds. New Zealand, March 11-26, 2019, a stunningly beautiful country mostly famous for sauvignon blanc and a bit of pinot (for wine) but that has so much more outstanding wine to offer!